Lip color has been a beauty gurus’ staple since the beginning of cosmetics. 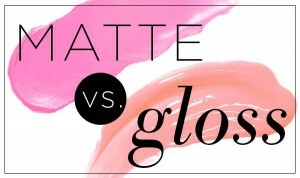 Although lip color trends go in and out, there is definitely a debate over which is the preferred look: Matte or Gloss. Matte lipstick essentially has no shine to it at all. It’s very pigmented. It really conveys bold colors in a way gloss can’t. Matte lipstick will last you for hours. You can eat or drink with a good liquid matte lipstick (Kylie Jenner Lip Kit) on. One downside however is that matte color can be very drying. Also, matte color can be a little harder to apply, you need a steady hand or a lip liner to ensure that the color is only going on your lips. It can be easy to overdo the lining and end up with a matte mustache. So it will take some practice if this is your look of choice. Gloss is a shiny, sometimes even shimmery finish. This is more of a light color. Most glosses aren’t very pigmented. Gloss is much more comfy for your lips, it keeps them moisturized. Gloss also tends to have a plumping, and therefore more youthful look. However, the wear time is much shorter and can leave your lips with a sticky feeling. Another con to the gloss is that you can’t really eat or drink without getting the gloss all over. If this is your look, be sure you bring it with you as you’ll be wanted to reapply throughout the day or event. Now that you’ve heard both sides, which one are you going to reach for? Matte or Gloss? This entry was posted in Makeup and tagged lip color, lip gloss, liquid lipstick, makeup trends, matte lipstick. Bookmark the permalink.